Of the three 1810 schemes (for extending the W&B canal) it is obvious that the one which would best serve the W&B and be the least costly to build was the Severn Junction (SJ). They required an alternative supply of coal having experienced difficulty in obtaining a sufficiently large quantity from the SCC and had, as we have seen, made some preparations for procuring this from the Forest of Dean. There were two possible routes from the Forest to the W&B. The Bristol Junction would open the way to the Severn without the expensive aid of the K&A; the Severn Junction, however, would be only half the length, an easier line to build and would make use of the T&S already deeply involved in the Forest coal trade. The T&S would obviously support the Severn Junction proposal in preference to the Bristol Junction which would threaten their trade with South Wales, and by providing another line for the distribution of South Wales and Forest coal would deprive them of the tolls they would collect from this trade and the coal supplied to the W&B via the Severn Junction. The estimated cost of the Bristol Junction is not known, but it would have been a difficult and expensive line to build, involving some 70 locks. By tapping the Gloucestershire coalfield it would provide a further alternative supply of coal both for Bristol and the W&B but as far as is known the W&B Proprietors had no such financial interest in this field as they had in the Forest of Dean. There had been talk in 1803 of the W&B obtaining coal from these pits by means of a railway from Pucklechurch to the River Avon. The K&A were prepared to support any such proposal but nothing was done at this time; the railway was built in 1832, the K&A being the majority shareholders. The W&B lost interest in the Bristol Junction when the GJ claimed heavy compensation for all coal and iron imported into their canal from an extended W&B; the W&Bs grandiose scheme of an all canal line from Bristol to London became much less attractive. In the 1810 proposal Whitworth stated that if the Severn Junction was built the T&S would have to alter their locks between their summit and Brimscombe Port. This suggestion would only be valid if the T&S renounced boats wider and longer than the narrow boats capable of navigating the W&B. Presumably he was concerned about the waste of water involved in the passage of smaller boats through locks 92ft long and l3ft wide. The 68ft locks below Brimscombe could by careful manoeuvring accommodate 72 ft boats diagonally across the 16 ft wide chamber. A meeting between representatives of the two Companies was held at Abingdon on 14th July, 1810. The W&B agreed to forget the Bristol Junction and build the Severn Junction but not on the lines earlier suggested by Whitworth and Black. The W&B end of the link was to be at or near Swindon and the T&S end at or near Cricklade below Latton lock. It was resolved that "The union of the two canals will be of very great Public Utility and of advantage to the Proprietors of both Concerns, allowing the T&S to bypass the bad upper Thames navigation. "(Ref.3) This agreement was a compromise, James Black again proposed his line between Shrivenham and Inglesham; this would be shorter and allow the T&S to use the whole length of their canal, but would increase tolls on coal to the W&B and introduce it some way east of the centre of the line. The Earl of Peterborough again turned this proposal down stating that while he personally favoured the idea he feared that Lord Radnor and Mr. Warnford would bring insurmountable difficulties on account of their extensive water meadows at Shrivenham. Black also urged the T&S to support the W&B in promoting the Abingdon-Marsworth link which would bypass the lower Thames; he argued that the double threat might stimulate the Thames Commissioners into action. Subsequent to the meeting he proposed that a regulating lock should be built with a one foot fall from the Severn Junction to the T&S; this he stated would ensure amiable relations between the two Companies considering that the loss of water incurred by the Severn Junction by the inclusion of such a lock would be slight compared with the sacrifice the T&S would bear in allowing 20 ton boats to use their locks capable of passing 60 tons. Whitworth too had second thoughts; he was concerned about the danger of floods damaging both canals. The agreed site of the junction meant that at the crossing of the Thames the Severn Junction level would be only 2 ft above the Thames surface. He proposed altering the site to Redfurlong Bridge ¾ mile above Latton lock thus bringing the SJ level 9½ft above the river. (Ref.4) This proposal was accepted and the flood danger also minimised by carrying the canal over arches allowing flood water to pass underneath. The regulating lock, however, was not built until 1826 and then only after the very unfriendly relationship Black had sought to avoid. The belief that the SJ would take water from the Thames had not yet been effectively scotched; rumours began to circulate which the W&B denied in a notice of 27th November, 1810, "Observations as to the intended Severn function Canal." In this Whitworth asserted that the canal had no intention of taking any water from the Thames over and above the 3,700 tons per day already supplied to the W&B by the Wanborough feeder, this quantity being sufficient for 24 locks. The W&B were empowered to build a reservoir at Coate and had also purchased land at Trow Lane, Tockenham for another to supply the lower levels west of Swindon. Apart from these large reserves, the summit level had been excavated 2 ft deeper and 6 ft wider than elsewhere, this extra stock of water could supply 10 locks per day for one month. There was therefore absolutely no need for water to be taken from the Thames at Cricklade. (Ref.5) Having thus attempted to reassure the Thames interests he proceeded to make a suggestion which he must have known would be highly unpopular with the T&S. He proposed that the SJ should be on a level for the 3½ miles between the T&S and the intended locks at Widdel Hill, that the supply for these locks be pumped from the SJ by an engine and then discharged back to the SJ, and that a regulating lock be built at the junction with the W&B. (Ref.5) The T&S would not countenance this suggestion that they should supply all necessary water. The finished canal had no such engine or regulating lock. The final 3½ miles was level and only stop gates protected T&S water. A Bill for the SJ was introduced in the House of Commons on 12th February, 1811 and immediately the University of Oxford lodged a petition against it. To this the W&B retaliated with a broadsheet in which Mr Hallett expressed "great astonishment at finding the University of Oxford petitioning against a canal which would so much benefit the poor of their City by producing a competition in coal as well as increasing the Tolls collected at their own lock called Boulters. "(Ref.6) This lock near Maidenhead would benefit From the extra trade resulting from the building of the SJ. Whitworth, who had been appointed as Engineer for the project, produced his estimate for the SJ in July 1811; if the Swindon termination were to be at Eastcott his figure was £60,000 and if at Swindon Wharf, £62,000. The fall of 59 feet from Swindon to Latton was to be divided into 11 locks to conserve water and the estimated price had been reduced by planning to cut for nearly 3 miles besides roads and across common land. (Ref.5) He weakened his previous argument that W&B water supplies were ample by this admission that there was a need to conserve water and also by asking that the Bill should seek to raise up to £10,000 for the building of Coate reservoir. that it is in the interest of the T&S to cooperate with the Thames Commissioners in making every practical improvement in the navigation from Lechlade to London, that from observations of very expensive works recently judiciously made at Culham, from information of others equally important actually ordered at Clifton and of more intended to be made with all possible despatch, and from reliance on the further assurances given by the Commissioners that the whole river within their jurisdiction should be forthwith be made an effectual navigation, the Proprietors of the T&S do not at present perceive any necessity for a junction with the W&B at Latton and therefore judge it now not expedient to consent thereto. The next joint meeting was held at the Ram Inn, Cirencester on 14th August with John Disney in the chair. He reported later that the meeting was well attended, many people being there who had no financial interest in either canal. 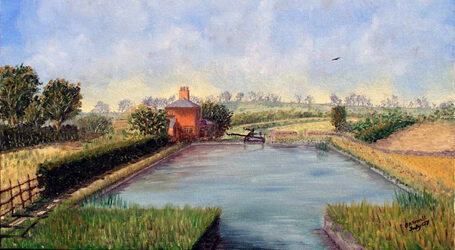 It was agreed that the project should go ahead and be renamed "The North Wilts Canal" (NW). Whitworth's survey and estimate were accepted, the W&B subscribing five twelfths of the cost, the public four and the T&S three twelfths. The meeting then adjourned to the same place on 28th October. A Petition in support of the NW Bill from "several Gentlemen, Traders and other inhabitants of Cricklade and neighbourhood" has been preserved; it is dated 2nd January, 1813 and has 45 signatures. The "Proprietors of the North Wilts Canal Navigation" could take water locally only during construction; they were not to take any from the T&S nor from any of the sources of the Thames. As all water used was to be supplied by the W&B double stop gates were to be fitted within 200 yards of that canal; these could be closed if the W&B, after inspection, were not satisfied that the NW were using water economically. The W&B were to be paid for all water supplied and could appoint three agents to take care of the NW locks. Another stop gate was to be fitted within 100 yards of the junction with the T&S who were to have powers to prevent passage when the NW water was lower than that of their canal. The Proprietors were empowered to raise £60,000 amongst themselves in £25 shares; if this amount was not sufficient another £30,000 could be raised either by the same means or by Mortgage or Promissory Notes. Work was not to commence until £44,000 had been subscribed. Tolls were to be the same as those taken by the W&B but those on goods between Cricklade and the T&S were to be reduced to one half. The Proprietors were to build an aqueduct at least 8ft wide and 7ft high over the River Churn and four other arches of similar size under the canal in the lands of John Lord Eliot to carry off flood water. The list of subscribers was deposited in the Office of the Clerk of the Peace in the County of Wilts on 14th September, 1813, together with a plan, elevations of the main aqueducts to be built, a sectional plan showing the location and fall of the 11 locks and also a list of the owners or occupiers of lands to be crossed. The remainder of the NW was built under the supervision of William Whitworth. It included a 100 yard tunnel at Cricklade and three small aqueducts following earlier Brindley designs and consisting of embankments through the bottom of which rivers flowed in three low culverts. The traffic from Brimscombe to London is almost nil. I hope to see the North Wilts proceeded with in the spring, the completion of which I have not the slightest doubt will materially improve our Tonnage. Tolls of £26 were collected during May 1818 but the canal was not officially opened, without fuss, until 2nd April, 1819. Priestley marvels that it cost less than the estimated price of £60,000, the actual cost being the £44,750 subscribed plus the £15,000 borrowed. 1 K&A minute book 10 July 1803. 2 TS 164a&c Blacks reports. 7 Thacker, The Thames Highway. 11 BRO D EEL 07. 13 JHC Vol 66 p37-230. 14 JHC Vol 68 p91-592. 16 WRO List of NW subscribers. 17 TS 193/22 and SRL D1-3. 18 TS 164C Aug 29 1816. 21 JHC Vol 76 p49-411.